The Pop Warner concussion scandal  - one that, sadly, occurred right in my backyard here in Massachusetts - has put youth football under the microscope once again. That a single game allegedly resulted in five concussions, of course, is cause for concern. That it clearly appears to have been, from everything I have read, the fault of coaches and parents bent on playing on, no matter what the score, no matter what the risk to their own kids' safety, is, not the least bit surprising in an increasingly winner-take-all society. That the game officials were apparently complicit is a bit of a surprise, although, given the recent trend towards lax rules enforcement in other contact and collision sports, particularly hockey , I that it has surfaced in youth football shouldn't come as a shock, I guess. But is what happened in that single game reason enough to pull a kid out of football, or never sign him (or her) up in the first place? But only if we actually learn something from the incident, not only about concussion safety but about a larger, much more endemic problem: the adults who are running and, in too many cases, ruining, youth sports. Simply put, as I have been saying for years, we need to put the word "youth," "games," and "play" back in youth sports. We can't allow anything (winning, home town or team pride, for instance) or anyone, most especially the adults involved - whether they be the officials who allowed the one-sided contest to continue and who have been appropriately barred from ever officiating another pee wee game, to the coaches, who had the audacity to blame each other for putting player safety at such risk, to the parents, who stood by while player after player was injured and knocked senseless because they wanted their kids to "soldier on" - to compromise player safety. Coaches need to be part of the solution, not the problem . While there are many coaches who take concussions very seriously, as the Pop Warner incident shows, there are still far too many in this country, from youth football, hockey, soccer, lacrosse or basketball all the way up the ladder to the professional level, who don't. Indeed, fully half of parents with children age 12 to 17 playing school sports admitted in a 2010 survey  to knowing a coach who would have a player return to sports too soon after a concussion. A 2012 survey  found that 52% of all coaches mistakenly believe that there is an acceptable amount of head contact (i.e. getting their "bell rung," "seeing stars") young athletes can sustain without potentially causing a serious brain injury, with the percentages of those who felt this way highest among coaches under age 35, male coaches, and paid coaches. This despite the fact that 9 out of 10 coaches know that most concussions occur without a loss of consciousness. Coaches need to actively, consistently and repeatedly encourage honest self-reporting  by athletes of post-concussion signs and symptoms, both their own and those of their teammates (such as by employing the same kind of buddy system football programs often employ to protect athletes from heat illness during hot weather practices and games). They need to put safety first. If they don't, they should not be allowed to coach. Period. Not suspended for the season. Barred from coaching for life. Parents need to put safety above winning. Of course, while there are lots of very protective parents, at the other end of the spectrum are some parents who, sad to say, are willing to sacrifice their child's safety and — in the case of concussions, their long term health — at the altar of a winning performance, a touchdown scored, a scholarship won, a pro contract inked. It is not only fathers who fall into this unfortunate category. There are also many moms who are over-invested in their child's athletic success, who enjoy too much doing what sports psychologists call "basking in the reflected glory" of their child's athletic achievements; and who are content to let their child's very identity  become wrapped up in sports; and who are unwilling — or unable — to make the decisions that I had to make: to end their child's dream of playing four years of high school sports, to take away something their child cherished, and, in doing so, put their child's very future at risk by allowing him or her to return to contact sports while still experiencing post-concussion symptoms or despite a history of multiple concussions. Some parents admit that they allow their children to play in such circumstances even though they know about the potential for adverse long-term health consequences, like major depression and permanent cognitive impairment. One 2010 survey  found that fully fifty percent of parents of children age 12 to 17 playing school sports knew a parent who would have their child return to sports too soon after a concussion. A 2012 survey  reported that nearly half of all U.S. coaches said they had been pressured by parents to play an injured child during a game. The most notable pressure is coming from parents, and being directed towards paid coaches - demands which may be hindering the coaches' ability to keep player safety as a top priority. Parents and coaches need more concussion education. Too many parents still think that concussions only occur with a loss of consciousness  and/or that it isn't dangerous to play with a concussion. Indeed, a 2010 national poll  by Michigan's C.S. Mott Children's Hospital found that less than one in ten parents (8%) of children playing school sports had read or heard a lot about the effects of repeated concussions , while fully one third (36%) hadn't heard or read anything about the effects of multiple concussions. A 2012 Safe Kids Worldwide survey  reported that three out of four coaches want more concussion safety training, but the same survey found that nearly four out of ten (39%) didn't think more injury prevention training would make much of an impact on the rate kids are injured, with nearly half (47%) agreeing with the statement that they had so many other responsibilities as coaches and so little time that they could not focus on injury prevention. Every person who coaches a sport in which there is a risk of concussion - whether it be football, soccer, lacrosse, hockey, even cheerleading - should be required to take a concussion education course. No ands, ifs, or buts. In the ideal world, someone trained to recognize the signs and symptoms of concussion  should be present at every youth football game, even for 7-year-olds, and, at the high school level, a certified athletic trainer should be on the sideline. Coaches must learn how to teach safe tackling. A recent NATA study  shows that high school players are at greater risk for concussive events in part because they haven't learned proper tackling techniques. Proper tackling technique  needs to be taught at every level, from Pop Warner to high school. At least one concussion expert thinks it might eliminate up to half of football concussions at the youth and high school levels. Youth football players should be taught what coach Bobby Hosea calls "Dip n' Rip" , a tackling technique in which a football defender stops the ball carrier with an upward thrust across the chest and shoulders, not by leading with his helmet. Rosemarie Scolaro Moser, Ph.D., sports neuropsychologist, founder of the Sports Concussion Center of New Jersey, and a MomsTeam expert , agrees. "A big consideration in all high risk sports is that at whatever age the youth transitions to contact or collision, whether 12, 14, 16, or 18 years of age, youth athletes will need to be trained to engage in safe, proper contact," she says. "Otherwise, lack of a proper program of training safe contact skill development will essentially defeat the purpose of setting an age designation. That means we will need educated coaches to teach safe and proper skill contact development in practices, so that when the youth athlete transitions to game contact, he or she will be ready, at any age. The rules need to be strictly enforced. 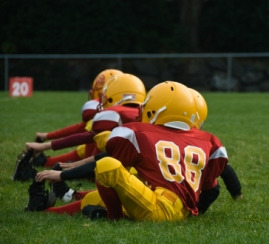 As the Pop Warner concussion scandal revealed, a failure to follow safety rules can unnecessarily put kids at serious risk of injury. Recent years have seen stricter enforcement of existing rules and numerous rule changes at the professional, college and high school level, all designed, at least in theory, to reduce the risk of concussion. A NFHS rule  now requires that a high school football player whose helmet comes off during play to sit out at least one play, which is intended to encourage coaches and equipment managers to make sure helmets fit properly (poorly fitted or helmets with improperly inflated air bladders increases the risk of concussion and more serious brain trauma, say the authors of a recent scientific paper ). The problem is, as the New York Times article  on the Pop Warner incident correctly observed, "rules are only as effective as the adults charged with enforcing them." Full-contact practices need to be reduced. The NFL and NFL Players Association have agreed to a limit of 14 full-contact practices during the season, less than one per week, primarily to limit exposure to brain trauma. The Ivy League only allows two full-contact practices  per week (rather than the NCAA limit of 5) and two-a-day full-padded practices have been banned, and the governing bodies of youth football have moved to limit full-contact practices, with Dr. Julian Bailes, chairman of Pop Warner's Medical Advisory Board, claiming in an interview with the Boston Globe that the new rules could "eliminate 60-plus percent of the brain impacts or concussions"), The irony, however, as the Sports Legacy Institute  notes, is that the National Federation of High School Associations and state athletic associations have not similarly moved to limit the number of full-contact practices at the high school level, thus exposing such athletes to levels of brain trauma that are considered dangerous and unacceptable for adults! That is simply unacceptable. "The toughest men in the world, NFL players, have asked to be hit in the head fewer times because they recognize there is no such thing as a tough brain. Children, who cannot provide informed consent, have never been asked that question, but I believe their answer would be the same," laments SLI co-founder Chris Nowinski. At the very least, SLI says, high schools could take a cue from pros: hit one fewer day per week. Delay the start of contact/collision sports. A more controversial approach to preventing brain trauma is advocated by Dr. Robert Cantu, co-director of the Center for the Study of Traumatic Encephalopathy at the Boston University School of Medicine, co-director of the Neurologic Sports Injury Center at Brigham & Women's Hospital, and co-founder of the Sports Legacy Institute. He argues in his new book, Concussions and Our Kids, that kids should delay playing collision sports such as football, hockey and lacrosse (or that the rules be changed to reduce or eliminate head contact, such as flag, not tackle, football and no body-checking in hockey). A delay in starting such contact sports or eliminating or vastly reducing contact, says Dr. Cantu, would reduce the amount of what he calls "total brain trauma," and with it the risk of long-term brain injury. The American Academy of Pediatrics has long recommended that children wait until middle school to play collision sports like football. (which is what my son did) Dr. Cantu's views aren't shared, however, by all concussion experts, most notably, Dr. Kevin Guskiewicz of the University of North Carolina. In a recent article in the Charlotte News and Observer , Dr. Guskiewicz said he believed it was important for young athletes to learn how to safely handle contact at an early age and develop those skills against competition of the same size and age. The question, however, is whether the safety advantage gained by learning to perform athletic skills at an early age is offset by the risk of brain trauma caused by repeated blows. I don't know the answer to that one. These are just the first six that came to mind. I am sure there are more. But, as with any tragedy (and yes, I think five concussions in a youth football game is serious enough to warrant being considered in those terms), if we don't learn something from the Pop Warner debacle we will have missed a golden opportunity to make positive changes, to turn lemons into lemonade, and to take the steps that we could take right now, this minute, to make youth football, and all youth sports, safer.